After my mystery blogger award, i had been nominated for the Real Neat Blog Award by Petrel41,Dear kitty. THANK YOU VERY MUCH PETREL41. IT IS SUCH AN HONOUR . Petrel41i is a great blogger. I would like all wordpress family to support by following petrel41’s blog. 2. Answer 5-6 questions asked by the person who nominated you. I wish to go paris,london. This is to see my beloved eiffel tower. I wish to… one day i will visit there. On that moment i can feel the world is on top of me. 5. If you could go back in history, to which person would you like to talk? I would like to talk to Mother Teresa who has sacrifices her life and reduce the poverty plus spread love everywhere she went. 6. If WordPress would stop, would you continue to blog elsewhere? I wish it never happens…..
1. Who is your favorite actor in HOLLYWOOD?why? 2. If you have super powers, what would you do? 3. What is the best and worst purchases you’ve ever made? 4. What is the most interesting thing you’ve read or seen this week? 5.if you could know the absolute and total truth to one question, what question would you ask? Once again Thank you to all my friends who support me so far. 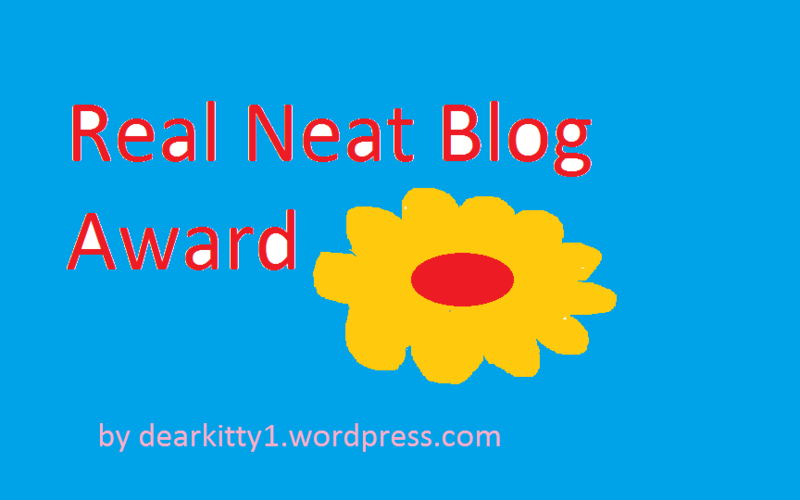 Tqvm…..
Do join the real neat blog award. I had nominated u. Do enjoy the questions nominee. Thank you so much Yaasotaa. Congratulations on another award. Great post. Omg!! Thanks a ton dear! I’ll surely post!! Paris is all time dream destination.. Kudos to ur 5th answer.. I enjoyed reading your answers and a question, why you would only want to go to saturn ? any specific reason for that? Nope but i feel its nice. I have the interest to know more about the saturn which have an orbit around it.